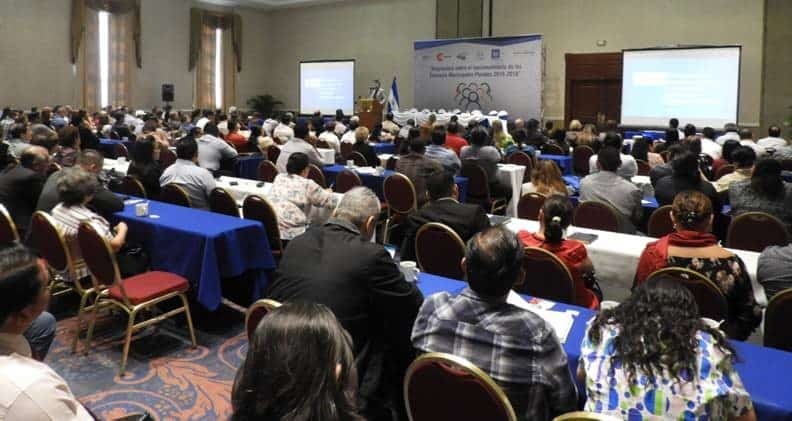 Large audiences of mayors, municipal council members, and citizens from El Salvador’s 262 municipalities attended events last week to discuss the Monitoring, Evaluation, and Learning (ME&L El Salvador) Initiative‘s evaluation of the role of Plural Municipal Councils (MPCs) in El Salvador between 2015 and 2018. Events took place in San Salvador for the central zone, Santa Ana for the western zone, and San Miguel for the eastern zone. The Government of El Salvador and USAID/El Salvador requested the evaluation to determine how effective the MPCs have been in broadening citizen participation in decision making at the municipal levels and in promoting participatory, deliberative democracy. 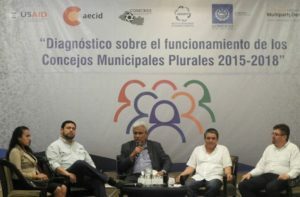 The evaluation team—comprised of a Bolivian municipal government expert, a Salvadoran lawyer, and a Salvadoran methodology specialist—analyzed the MPCs’ main advantages, challenges, and limitations as identified by their members, public support organizations, and local civil society representatives following the electoral reforms of 2013. Mayors of the Eastern Region, Undersecretary of Governance, and the consultant Diego Ayo dialogue about the evaluation’s results. The evaluation determined that the MPCs have enhanced participatory democracy, but there is room for improvement. The MPCs’ operating principals and procedures have been standardized and applied, and members of different political parties collaborate in them in a pluralistic fashion. Municipal mayors exercise various forms of leadership with some of them still practicing authoritarian leadership. Mayors who spoke at the three presentations emphasized the need for Salvadorans to unify and work together across party lines to achieve the country’s development goals. The audience for the evaluation is USAID/El Salvador, the Under-Secretariat of Governance of El Salvador, the Corporation of Municipalities of El Salvador (COMURES), and the Salvadoran Institute of Municipal Development (ISDEM). The evaluation team conducted it via a participatory process that included mayors, MPC members, municipal government specialists, society organizations, academic institutions, and ordinary citizens. USAID/El Salvador awarded ME&A the ME&L El Salvador task order in 2016 under the Policy, Planning and Learning-Learning, Evaluation and Research (PPL-LER) IDIQ Contract to provide evaluation, monitoring and assessment services for USAID Missions and Offices worldwide.